Product prices and availability are accurate as of 2019-03-14 06:51:53 EDT and are subject to change. Any price and availability information displayed on http://www.amazon.com/ at the time of purchase will apply to the purchase of this product. European Mountain Ash is frequently planted for its showy clusters of white flowers in spring followed by an excellent display of fruit that develop in tight clusters 4-5" wide. Individual fruits are about 3/8" in diameter. Fruits start maturing in August and hang on through October. Mature fruit color is usually bright orange with selected cultivars ranging from pink to red. Leaves are pinnately compound. Tree form is oval broadening to round headed with age. 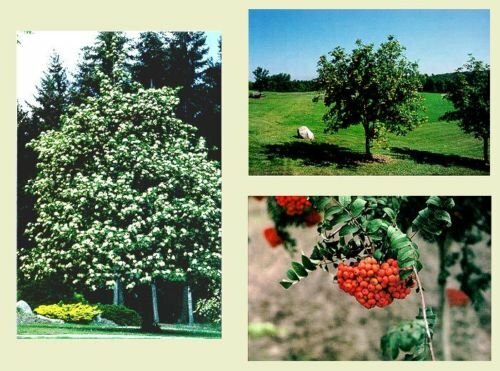 European Mountain Ash prefers a cool, rich loam soil, with good drainage. Full sun is needed for good development. Needs to be kept well watered during hot, dry periods. The European Mountain Ash can reach heights of 25 feet and widths of 25 feet.